The soffit and fascia form an important protective barrier for your home in Minneapolis, or any surrounding community in Minnesota. The soffit is that part of your home’s eave that seals off the tails of your home’s rafters, while the fascia is the horizontal board that caps off the rafter ends. Together, they protect your home from bats, birds, squirrels, and other pests making their way into the attic, as well as providing an attractive visual component for your roof line. At DuBois ABC Seamless, we know how to protect your home from pests and keep it looking great for years to come. That’s why we install soffit and fascia using sturdy 28-gauge galvanized steel, and we fabricate it right at your home, using the exact dimensions of your home’s eaves and roofline for a precise fit. It’s secure – We attach our materials using screws, not staples, so you can trust that everything will stay in place, even when gale-force winds blow. It’s attractive – With appealing colors that precisely match our siding materials, you’ll end up with a cohesive, unified, finished look for your home in or near Minneapolis. It’s low-maintenance – Unlike wood, you’ll never need to scrape or paint your eaves again, and our materials will never get chalky like so many aluminum soffits and fasciae do. To learn more about how we can improve your home in or near Minneapolis, MN, by installing quality steel soffit and fascia, give DuBois ABC Seamless a call today. 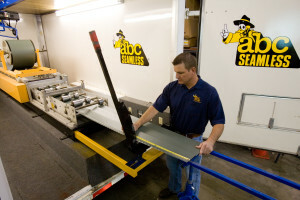 Discover for yourself why DuBois ABC Seamless is the home renovation company of choice in the Twin Cities area.